Speed up your Wash Cycles by 25-30% with Wash Wings! 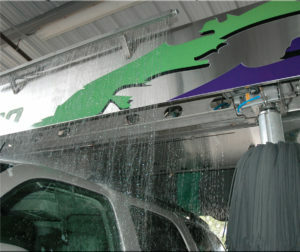 Wash Wings to their gantry with minimal time and expense. Wash Wings use three separate rain bar type applicators for products like Rinse, Low pressure wax and spot free rinse exactly as the tunnel industry has done for years. Installation is simple and quick. The stainless steel rain bars are designed to mount using existing frame work with no welding necessary. An operating program change would be included with the components. Spot Free application will continue to use one of the existing side tips for a more complete coverage. Once the mechanical and program changes are made, the wash recipes will be modified to include these three functions on the same pass. The system will handle the rest. 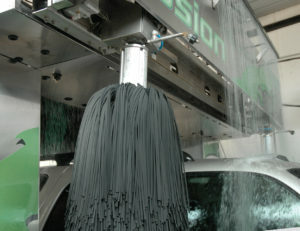 Within a few short hours you could be washing many more cars per day!